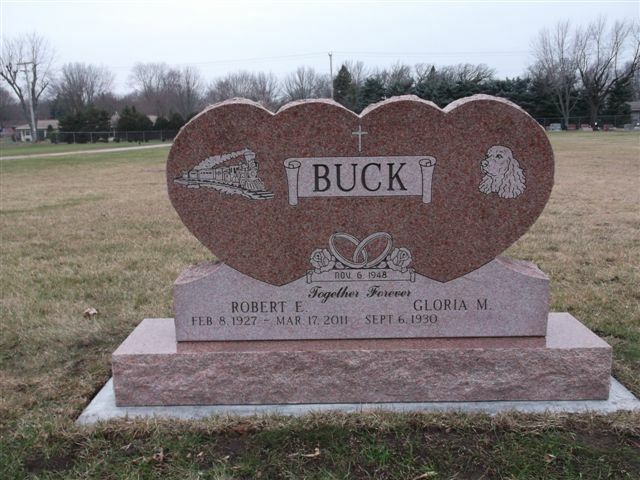 We can provide great cost savings on your memorial marker, beacause we are a non-profit Christian Association. This website is intended to help you understand what is involved in buying a memorial. Naturally, when you and I make a decision to buy something, we don't like doing it when we don't know what we are buying. Often the first question we ask is "How much is it?" We do this because we can at least compare prices. It should be noted that these are the common items that determine price. Specific dealers may offer pricing structures differently. Many companies have extra charges in addition to these such as delivery, installation at the cemetery, carving design, or custom piece work. Size - Size of memoial is the main factor in the cost of the production. Naturally the larger the memorial the more time it takes to manufacture. The cost increases with more weight and surface area of granite that has to be cut, polished or contoured. Color - Color is another factor in cost of a memorial. Granite comes from all over the world, oversees and throughout the United States. However, a large amount of granites are quarried in the Midwest and in Vermont. Naturally, granite colors that are quarried in the Midwest and Vermont are less expensive than the colors that come from overseas out of this region. 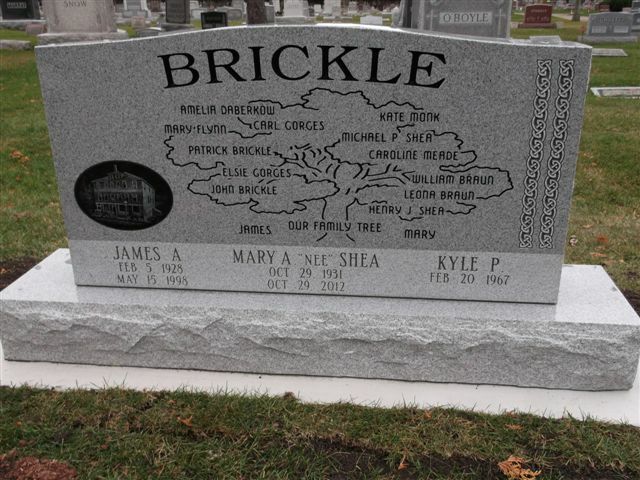 Also certain colors of granites are harder adn take much longer to cut, shape, and polish thus adding to the cost of a memorial. Finish - How much of a surface of the granite is polished and specially contoured also affects the cost. Polishing adds to the cost of a memorial because of the labor hours and materials required to do the polishing. Thus, the more area that requires polishing, the greater the cost is. Whereas, surfaces that are left with a natural rock finish are less expensive. 1. Granite Quality - Granite quality is determined by hardness, uniformity and clarity. Hardness determines how well the granite can be polished and how resistant it is to the elements of nature. The harder the granite, the better the quality. Uniformity is determined in the granite's grain structure. One area of the granite surface should look the same as another area. There should be no knots, streaks or veins that scar teh monuments appearance. Clarity is simply how clear and sharp the color is in the granite. The granite should not be muddy looking in appearance. The color of granite is determined by the different mineral contents. Granite is similar to wood, it comes in various grades of quality. 2. 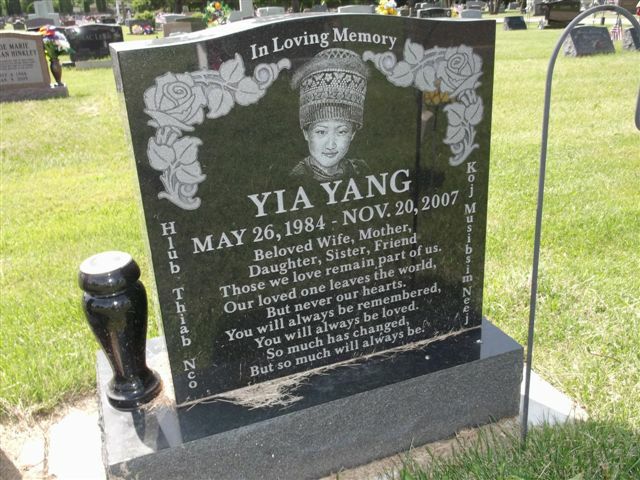 Lettering Quality - Lettering quality is determined mainly on how deep the lettering is cut into the granite. Also, there are many different types of lettering styles available: some work well on certain colors, while others do not. Durability and contrast are key elements of lettering quality. 3. Carving Quality - Carving quality differs greatly between granite companies. Almost all companies do two-dimensional carving (commonly called flat carving), whereas very few do three-dimensional carving. Naturally, three-dimensional carvings vary depending on the skill and experience of the craftsman. 4. 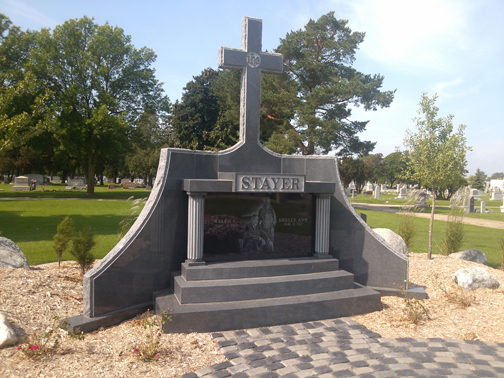 Design Quality - Design quality deals primarily with artistic appearance of a memorial. Is there balance between space and design? 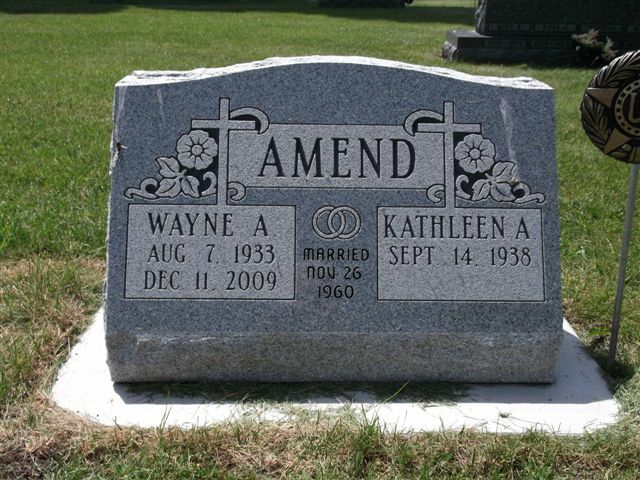 Have you used space efficiently and planned for future burials. 5. 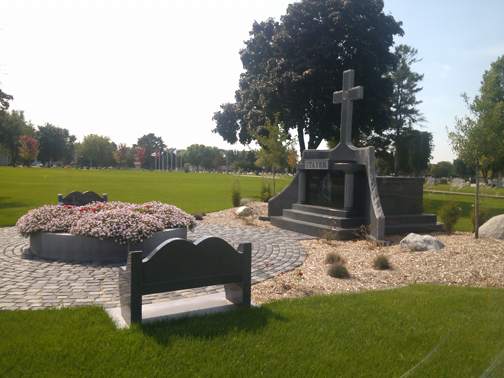 Installation Quality - Installation quality is determined by how straight and level a memorial is set in the cemetary. Is the monument sealed together completely so it does not tip over? Once the setting is complete, is the lot cleaned up and left in good shape? These are just a few things that you need to be aware of with regard to the setting of your memorial. Normal delivery ranges from 6 to 8 weeks. However; service entails much more than time. Service deals wih selection from a large range of colors and designs, personal consultation, servicing problems in the future, adding final inscriptions on the memorials when needed. AND WE ARE COVERED THROUGH INSURANCE AGAINST VANDALISM!! !